Truly, my favorite holiday. My favorite day of the year. Costumes and candy: feeding both the actor and the sugar addict within. A couple years ago I spotted this thread of Craftster.org of a Vintage Voodoo Doll and I knew I wanted to recreate it for my own costume. I wasn't able to get organized enough last year, but this year, with the help of a sewing machine, I was able to pull it together in time. I love the juxtoposition of it being the creepy voodoo doll combined with the prettiness that you would see in a dolly. I tried to play up these opposites as much as I could. I used the Danielle pattern from Burda, with the only real alteration being that I shortened the sleeves significantly. I also decided to use an extra long exposed metal tooth zipper up the back for more of the voodoo grittiness. Added to the basic dress was a red felt heart with exposed black running stitch around the edges and for the pins I used two of my smaller double-pointed knitting needles with styrofoam balls painted black on top. Top it off with some fishnets, red hells and X's over my eyes and I was in business. 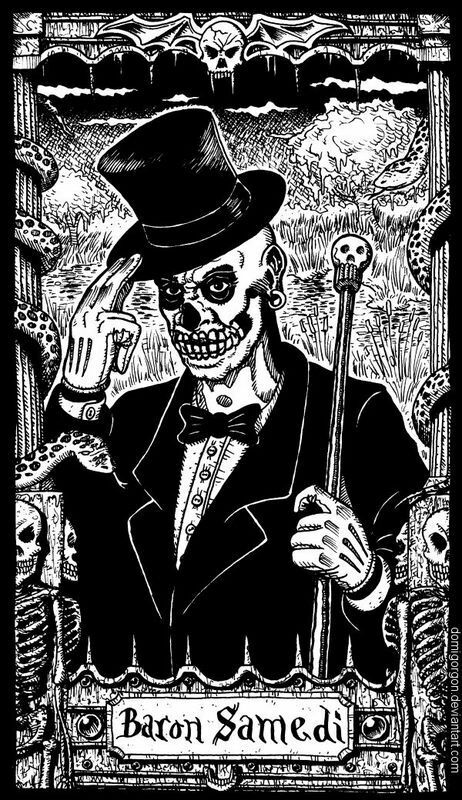 My hubby wanted to find a costume that could share theme with mine, so I suggested Baron Samedi or a New Orleans with doctor. Here he is, almost in his full costume, with me. Many people got what I was, but felt they had to check to make sure. I'm slowly discovering how many costumes don't carry over as well in The Great White North since it isn't as common a cultural reference. I had almost decided to go as the Morton's Salt Girl one year, and it is a good thing I didn't because it turns out they don't sell Morton's up here and nobody would recognize the image. Sela vie. Regardlesss, I quite enjoyed the costume for the night. I only wish Halloween lasted longer. Thanks for the awesome blog! I'm looking at going as a Voodoo Doll for a upcoming dress-up party, but feeling very intimidated by the 'pins'. Any tips? Were they annoying and poked you all night? Actually, they were surprisingly easy. I just made sure to get them set at a good angle so they wouldn't impede my motion or be as likely to fall out during the evening. Good luck with yours!